Ita Gibney, community centre chairperson: "It's very disappointing"
Two people have been injured in a car bomb explosion outside a police station in Newtownhamilton, County Armagh. The explosion happened at about 2325 BST. Police were told in a call to a Belfast hospital about an hour earlier that a vehicle had been abandoned. Officers were en route to the station, which is staffed on a part-time basis, when the explosion happened. The two people's injuries are not life-threatening. The bombers had fired shots in the air before driving off. The two people who were treated in hospital - a woman in her 80s who was blown off her feet by the blast and a man who sustained a minor shrapnel injury - are said to have been left "extremely shaken". Structural damage is believed to have been caused to the police station and other homes and businesses were also damaged. The car in which the bomb was placed completely disintegrated. Local people criticised those responsible for leaving the device and the police response which meant that homes were evacuated by the fire service. Last week, the Army defused a car bomb outside the village's police station, one of a number of attacks on police and security bases in Northern Ireland recently, including an explosion at Palace Barracks in Holywood. Presbyterian minister Rev Kerr Graham said local people felt abandoned by the police. 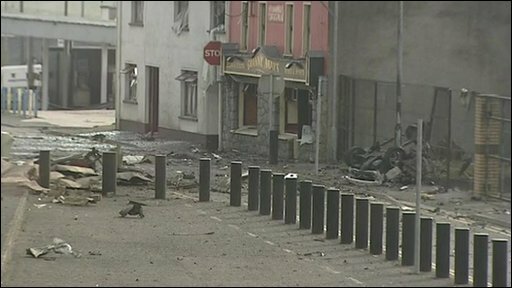 "The fact that dissidents can return to this village in just over a week to plant a second bomb says it all really. "The question I would have for the police commander is 'where is the border?' because there are rumours in this area that the police will not come past Markethill," he said. "There's a fear factor that these people are able to come in and out plant their devices and leave. The fact that the fire crews last night had to evacuate the area is appalling." 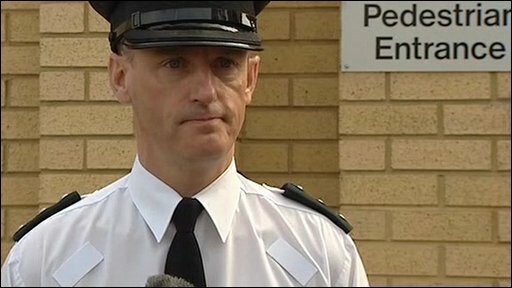 However, PSNI area commander Chief Inspector Sam Cordner, said officers responding to the bomb warning had to do so with caution. "This was an attack designed to murder police officers and our response needs to be thought through and measured," he said. "These are people who are hell-bent on killing police officers in this area." He praised the work of firefighters who moved people from their homes. "Due to the swift actions of fire service personnel who were on duty in Newtownhamilton at the time loss of life was prevented," he said. The bomb is believed to have been in a white Toyota Corolla and detectives have appealed for anyone who saw it being abandoned at the station, or beforehand, to contact them. The attack came as security sources told the BBC the threat posed by dissident republicans in Northern Ireland was higher than at any time since the Omagh bomb almost 12 years ago. The explosion was reportedly heard up to 10 miles from the scene. 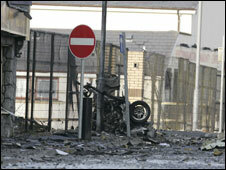 Northern Ireland's first and deputy first ministers have issued a statement condemning the attack. Peter Robinson said it was "cowardly and evil" while Martin McGuinness said those responsible had nothing to offer "but hardship, division and pain". Justice Minister David Ford said the bomb was "not just an attack on the people of Newtownhamilton, but on the wider political process and it will be condemned across the community". "Those who planted this bomb want to drag Northern Ireland back to the dark days of murder and mayhem, they want to undermine the political process, they want politics to fail," he said. Meanwhile, a pipe bomb has exploded behind a house in Chestnut Hill in the Brackaville area of Coalisland, County Tyrone at about 2330 BST on Thursday night. A man and a woman, who were in the house at the time, were uninjured but a number of windows were damaged.